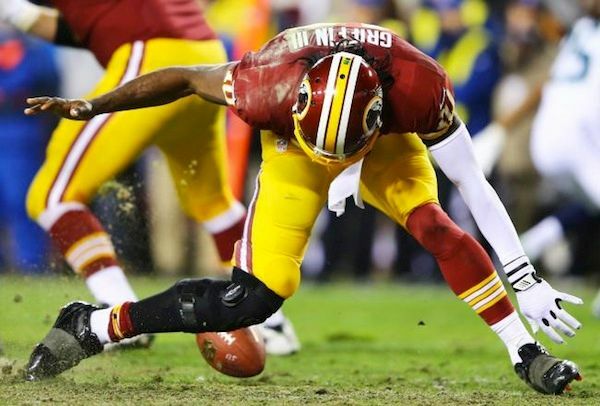 Although it is only a little more than a month since Robert Griffin III underwent reconstructive knee surgery, Washington Redskins officials are encouraged enough with his recovery to believe he has a legitimate chance to start in the 2013 opener, according to team and league sources. Griffin recently returned to Washington, where he spent some time rehabbing. Those who know him insist he is a physical freak, not unlike Minnesota Vikings running back Adrian Peterson, who was able to rush for 2,097 yards and win the MVP award the season after undergoing major knee surgery. The Redskins know there still is a long way to go, and they're hardly going to rush Griffin. But they also know that based on what they've seen so far, it is well within the realm of possibility that Griffin will be the team's starting quarterback in Week 1. Griffin won The Associated Press 2012 NFL Offensive Rookie of the Year award after setting the NFL record for best passer rating by a rookie quarterback and leading Washington to its first NFC East title in 13 years.